(Newser) – Former teachers say alleged school shooter Nikolas Cruz wasn't somebody who slipped through the cracks, he was somebody they worked hard to get help for. The teachers say that after behavioral problems in middle school and high school, they tried calling social workers, holding parent conferences, and sending him to counseling. "His behavior in class wasn’t constantly wrong, but every once in a while, it was," a teacher who worked with Cruz in sixth grade tells the Washington Post. "He would just spew something out of his mouth that was inappropriate." She says teachers worked "very, very hard" to get Cruz into a school that helped emotionally disturbed youth. 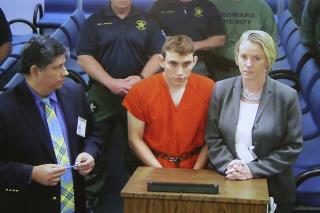 They eventually succeeded, but he ended up leaving the school for Marjorie Stoneman Douglas High School, where he is accused of killing 17 people. From the short little clip it looks like he's outnumbered (read being picked on). While he (Cruz) is ultimately responsible for his actions he was failed by society. Now we hear that he threatened the POTUS. I thought that was a federal crime --- why didn't that get him locked up? Sound like a victim of bullying by libtards.